Visiting Bratislava for longer? Wanting to see something different apart from the main tourist attractions? Bratislava has luckily a lot to offer! Thanks to its rich cultural heritage and communist past, there are many surviving monuments, standing as everlasting proofs of this long-gone era. If you prefer concrete functionalistic buildings to romantic walks in the Old Town, we have a couple of tips for your trip to experience the brutal socialist architecture of Bratislava. The fountain looks quite impressive, right? It is made out of stainless steel and its core represents a linden flower which is the symbol of Slavs. Prior to the revolution the square was officially known as the Gottwald Square (with a gigantic statue of Klement Gottwald, which was luckily removed), but the old town people used to call it Firšnál. Just a street apart from the Freedom Square, enjoy the second stop of our socialism trip – the building of the Slovak Radio, also called the Pyramid. It was referred as “the building of the century” because its construction took a very long time. The project was established in 1967 already and the building was finished only in 1983! Its second nickname is the “iron fist of the regime.” So relax, breathe in the energy of the past and enjoy this extraordinary building as a silent witness of the former regime. Its architecture is very original as it is built in the shape of a reversed pyramid. The material of the construction is mainly steel. The first experimental broadcasting was started in 1984 and a year later the broadcasting became regular. It also contains an excellent concert hall with one of the biggest organs in Slovakia. Many classical or alternative music performances still take place here. This awesome bridge has several unique features. It is the only bridge in Bratislava (the first one in Slovakia and the second in the world) to have no pillars in the river that hold on steel ropes only. UFO is the only tower in the World Federation of Towers which serves as a pylon for such a construction. Our bridge even inspired Riga’s Gorky Bridge built as a copy of ours. 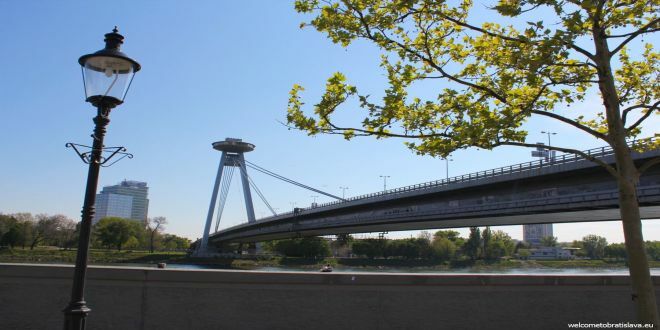 A couple of facts for arithmetical freaks – they built the SNP bridge in years 1967 – 1972, it is 431 metres long and 21 metres wide and connects Bratislava’s largest borough Petrzalka with the Old Town. If tired by the walk, have a short break at the UFO watch.taste.groove restaurant situated in the altitude of 85 metres, directly in the flying saucer! You will get there by the elevator in one of the askew arms of the pylon. Sip a cocktail and enjoy the splendid view of the Old Town as well as of Petrzalka’s concrete panelaky which are on our list as a next stop. In order to experience the Petržalka borough, caricatured as Bronx of Bratislava, cross the Danube river to its right bank. There you can enjoy the largest concentration of rough concrete high-rise housing units across the landscape of a Central Europe formerly under communist control. 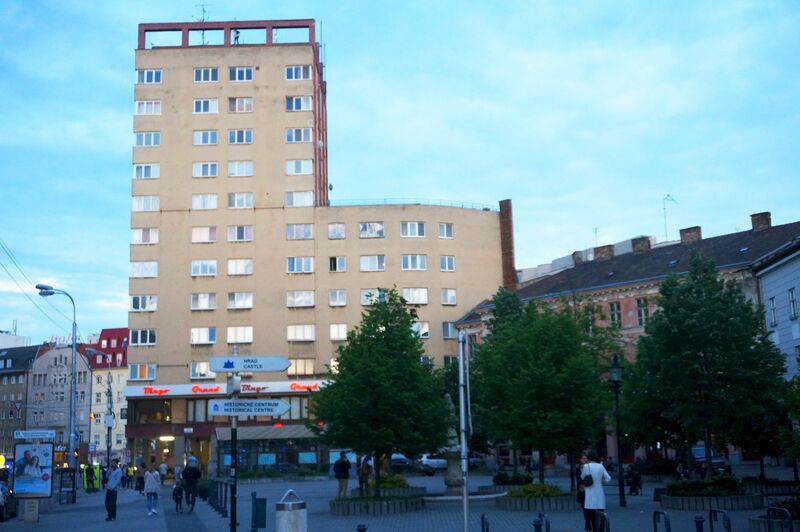 The Slovak name of this functionalistic apartment building is “panelak”, having its roots in a technical compound term for “panel house”. Vaclav Havel, the first post-Communist president of the Czech Republic, famously called this signature housing “undignified rabbit hutches, slated for demolition.” Not very appealing, is it? So why not to miss panelaky? Panelaky were rapidly assembled and cheaply built to solve a post-World War II housing crisis. At the same time, they also expressed a basic aspect of Soviet ideology, providing egalitarian habitat for humanity. The idea was to build as many apartments as possible taking up the smallest possible area. Construction activities started in 1973 and the first panelak was ready for moving in in 1977. If you are ready to get lost in a jungle of concrete buildings, join over 100 000 inhabitants of Petrzalka for a small stroll. 50 shades of grey so typical in the past have been replaced by pastel colors, creating an unforgettable experience. The construction of the university complex started in 1983 and reflects the style of that time. Admire the huge buildings surrounded by green areas with trees and grass. Do not forget to notice the colourful inscriptions on the pavement in front of the University. It is the habit here to write your newly gained academic title plus your name down together with your classmates after the graduation. What we consider for even more interesting is a huge sundial that lies within the university premises, close to the Faculty of National Economy. It is lovely – minimalistic in its pure lines but impressive in its size. 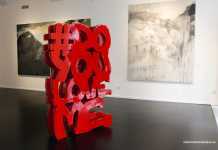 It depicts a figure in the centre, a kind of Da Vinci’s Vitruvian Man. For years, the clock has been forgotten, destroyed by graffiti and occupied by homeless people. A change came in spring 2015 when a group of volunteers from NGO Na hrane revitalised the area and changed the sundial into a bouldering wall. They cleaned the area and covered it by grass, cleaned the clock from graffiti and placed the bouldering anchors. In 2016, they organized the second edition of bouldering competition here. Now the sundial has not only artistic but also a social and functional purpose. Now back to the city centre. Premises of the Slovak National Gallery represent one of the most controversial topics of modern architecture in Bratislava. Hated and criticised by all Slovaks and internationally recognized and admired abroad. Why is it so? The Slovak National Gallery occupies actually a complex of buildings – one is the historical Esterhazy palace in a Neo-Renaissance-style from 1760, the second one being the Water Barracks in Baroque style from 1870 and the additional menacing 1970 extension, bridging the complex built during socialism era which is actually the kicker. Public just hates this bridge. On the contrary, experts widely accept it. They praise that the architect opened the view in the courtyard and the Water Barracks, creating an unbelievable visual spatial connections thanks to open floors. What do you think? Kamenne Square with a huge marble shopping mall “Prior” in the past (now Tesco) and slightly disastrous hotel Kyjev is really something! Built in 1960, it is a unique representative of former artistic, architectural and urban opinion. Quite monstrous and very functionalist, still remains one of the central squares in Bratislava and represents a popular meeting point for young people. Do notice a huge marble stone in front of the Tesco store – it contains an embossment of a floor plan of Tesco stores, hotel Kyjev, Ministry and name of the architect Ivan Matušík. A Viennese company constructed Manderlak in the style of purist frugality. It has impressive 11 floors and with its 45 metres it was the highest building in Czechoslovakia at the time of its creation. Kind of a first skyscraper in Slovakia:) The first floor contains a coffee place Grand which used to be the centre of Bratislava bohemianism. Now, they organize regular bingo events here and it is like entering a different world full of retirees fully focused on bingo numbers. If you are keen on an absurd atmosphere, we recommend to come here. Slovaks were waiting 27 years for the new building of the Slovak National Theater. They often refer to it as the “Building of Two Centuries”. The idea of the new building began in the 70’s and the first stone was laid in 1984. The curtain was however raised for the first time only in 2007. Why did it take us so long? The main reason is political – after the revolution, everything what was created as an idea before November 1989 was simply unwanted and rejected. The idea of general public was that this megalomaniac communist building is not suitable for the modern theater productions. The second reason was an economic one – the stagnation of construction activities hugely increased the costs of this project, which made the building quite famous within Slovakia since around 166 million € was invested! The building has seven floors, over 2000 rooms and three main halls (Hall of Opera and Ballet, Hall of Drama and Studio). Now let’s get out of the city centre and explore other neighbourhoods of Bratislava. Full name of this remarkable functionalist building is House of Union Istropolis or House of Revolutionary Union Movement. It is a congress-cultural centre at Trnavske Myto, a busy crossroad and important point of public transportation. They created it between years 1956 and 1981. Many changes undertaken during its construction caused this long duration of 25 years. The most interesting fact is that Fidel Castro donated the Cuban marble that covers the external walls of Istropolis. Right across the street you can see the huge Market Hall which we refer to as the New Market Hall built in the 80’s. They built it in the architectural style “high-tech”, keeping the ventilation system visible – this style is famous thanks to Pompidou Centre in Paris. Kukurica (translated as “corn”) is a nickname for the hostel Hviezda, a former military boarding house situated in Nove Mesto (New Town) neighbourhood. Pay attention to the specific shape of this building and you will certainly get why “the corn”. Under the administration of Ministry of Defence, it offers accommodation for 2600 people. Be sure they are of the lowest standards and we would definitely not recommend to stay here. Out of 22 floors only 14 are in use as the rest is unfit for any type of stay. It was a unique and unconventional project in the 70’s – it was the highest building in Bratislava of that period and the highest building with round ground plan in Europe. As a result, the rooms are not square but conical. The challenge was also the building’s height since the cranes reached only until the height of the 10th floor. Another interesting detail is the special colour of the window glass, reminding the oil spill and reflecting the light. This is a quite typical building in the decorative style of social realism. The rumour has it that in May 1951 the communist chiefs decided to build a student home for 2500 students and dedicated 2 weeks for the project only :D They expected students to move in at the end of year already. This daring idea was at the end finalised only in 1955. Mlada Garda is a complex of housing pavilions connected with covered halls and creating symmetrical ensemble. The symmetry is underlined with a clock tower over the central building, copying the renaissance bell towers from the Spis region. This stop of our journey is only for those who want to get to know our culture and city more closely and know perhaps somewhat about our old movies. Zuzana’s fountain was created in 1985 as a scene piece for a Czechoslovak movie Fountain for Zuzana. It is interesting to know that at the time of movie-making, it was not functional and had to be connected to firemen vehicles to be able to produce water. Since many Slovaks are proud of this movie and like the love story it represents, the fountain was renewed in 2008 as a symbol of local patriotism. You can find it on Kupeckeho street in Bratislava’s neighbourhood Ruzinov outside of the city centre. And now it has real plumbing and works tremendously. Even if the fountain carries no communist message and is rather a symbol of love, its architecture is pretty brutal nevertheless! Read more about Bratislava fountains! Built between 1967 – 1975 and 194 metres high. Kamzik Tower stands on the Kamzik hill which is 439 meters above the sea level. It is an actual TV tower. It i also the second highest point of Bratislava with tremendous architectural, construction and functionalist solution, combining architecture and engineering. On its top, there is an observation deck. From here you can have a perfect view on the whole city. You can even see the territories of boarding countries with Slovakia. There is a restaurant and a bar so you can enjoy the view along with having something tasty. This track is for sure not for everyone. If you prefer the concept of pure beauty, just ignore this article. These sights are waiting for those who find an interest in the historical aspects of architecture and for those who can appreciate the past of ideological concepts and functionalistic importance of such sights. Would prefer to taste socialist Bratislava? Here are a couple of our tips! Tired of walking the whole day? Finish your wandering in a local pastry shop in Trnavka. It is part of Bratislava’s neighbourhood Ruzinov close to the airport (so really really far away from the city centre). They have excellent old school pastries, as copied from the deep socialism times. Try their “špic”, “veterník” or “kávové zrno”. Lacinka is a hidden gem of Bratislava’s old times. All natives will know what you are talking about when saying „Lacinka“. They believe its salty or sweet pancakes of many types dusted with sugar are some of the best in town! And are definitely the best value for money. Just to set things straight, do not expect a fancy place. When entering a subtle yellow old building, you will fall into a different world. 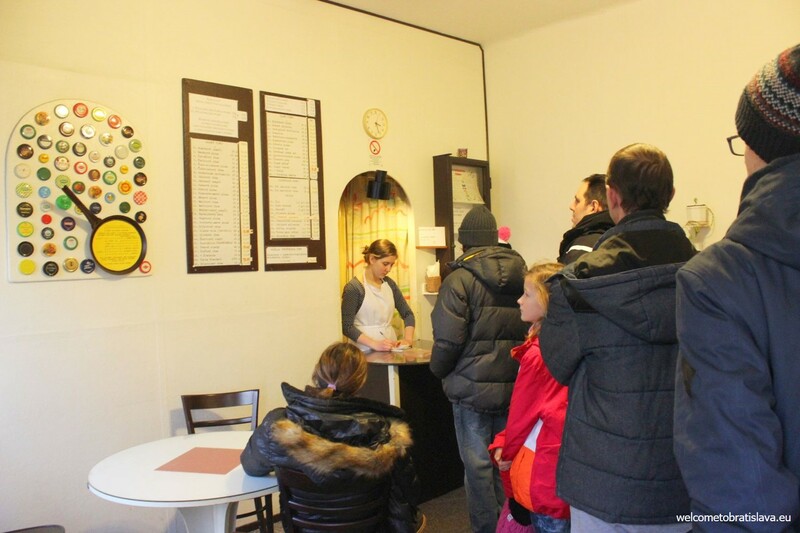 This super tiny space with a long queue of pancake-craving customers reminds us of a school canteen in socialist Slovakia. Staff in white coats or alternatively aprons look more like in a butcher’s shop than in a pancake place. 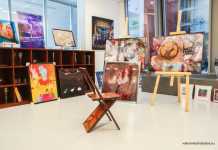 But this is part of the special atmosphere, so don’t hesitate to visit! 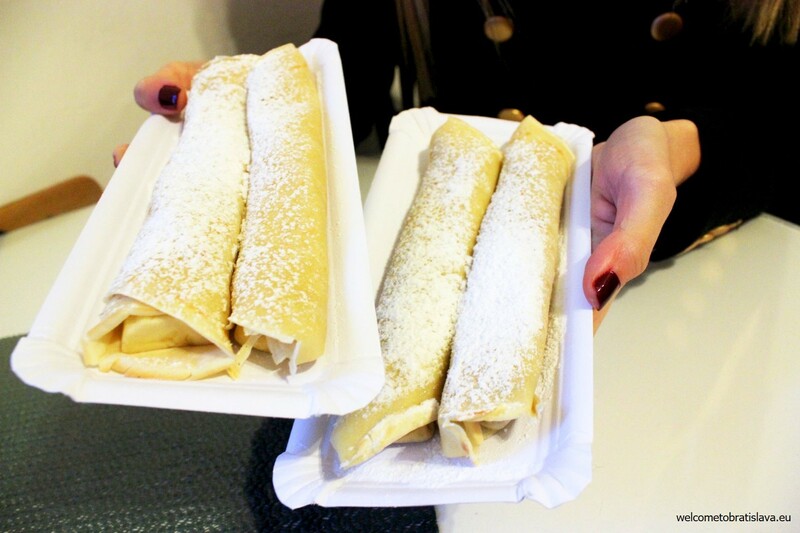 Read where to have all kinds of pancakes in Bratislava! Situated close to a popular market place on Mileticova street, there is a special old school store called Ryba (translated as the “fish”). It offers the best cod-fish (treska) and Parisian salad (parížsky šalát) made out of mayo, salami, peas, onion and cucumber. 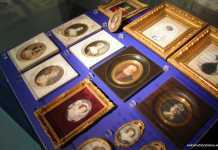 Why we mention these? Cod-fish with bread rolls was a typical meal of the working class. Dobrú chuť!